New facilities can be built on a minimum gradient of 7%. The substrate barely matters, however. The Mountain Coaster can be installed on any terrain, no matter if it is rock or soil. Our long experience in setting up summer adventures and in the theme park industry enables us to offer many solutions that will turn your track into a truly unique experience with a special power of attraction. Set yourself apart from your competitors and sustainably increase your economic success. 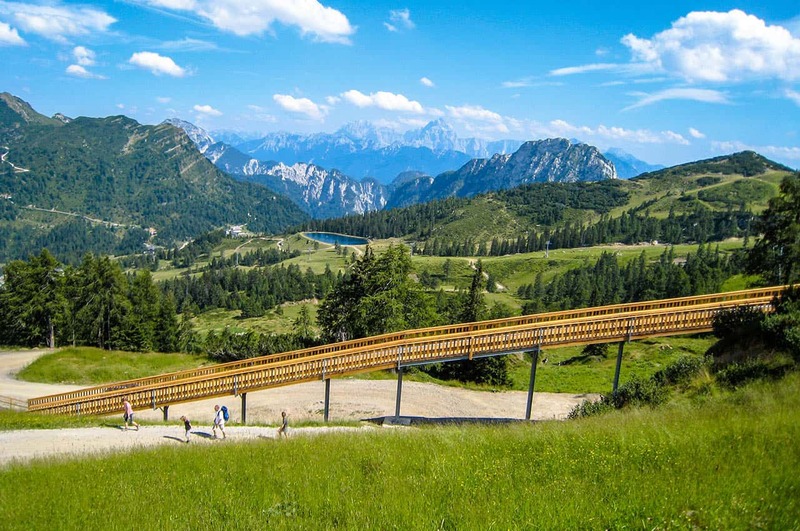 Tip: Add new highlights to already installed Brandauer summer toboggan runs with the help of subsequent design additions and themes for the ride to inspire visitors to return. 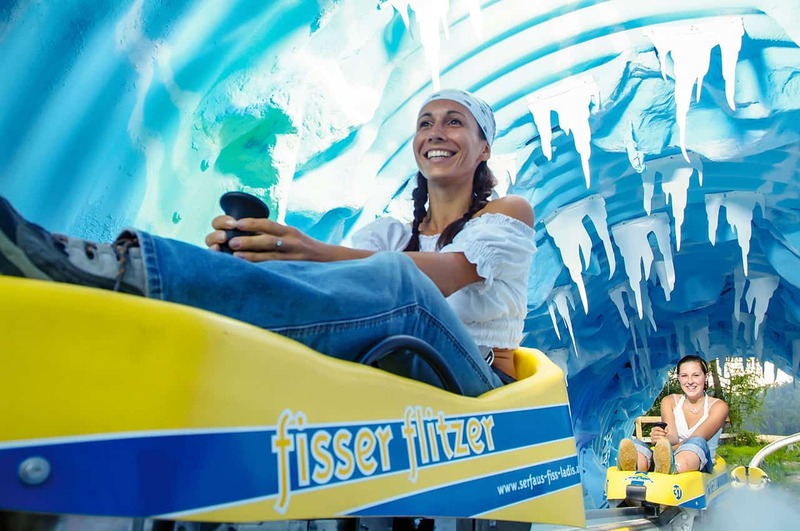 • Theme customisation: No matter if you have an adventure world in the mountains or a theme park: people who plan leisure-time experiences around the world know how important proper theming of rides and attractions is for commercial success. Present a story or legend from your region, build a course with wild animals, send your guests on a trip to the Ice Age or into the realm of the dinosaurs. We will develop the best concept together with you and bring it to turn-key completion. 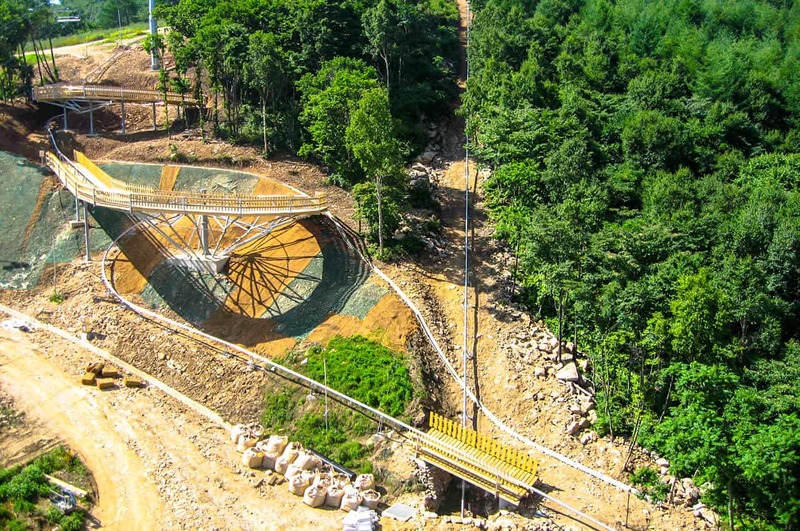 • Bridges & tunnels: Bridges, tunnels and underpasses not only serve to optimally adjust the track to the terrain, and to cross above or below paths and roads, but are also an important part of the Mountain Coaster presentation. These elements are versatile and may occur as simple routing elements, or can be skilfully presented with lighting and decorative elements. • Helices, turns & twists: Like roller coasters, summer toboggan runs can use certain structural elements that sustainably influence the ride. A helix is made of one or several 360 degree turns with a consistent radius that are inclined upwards or downwards. Such buildings often form the highlight of a ride with the Mountain Coaster, but often require earthworks and foundations. • Water: The toboggan dashes down a small slope, where the rider suddenly spots a small pond or strip of water ahead. The track barely protrudes above the surface and the rider will glide just a few centimetres above the water. By adding automatic splashing effects, you can give your customers a truly memorable experience. • Jumps: Of course, these aren't real jumps where the toboggan leaves the track, but route elements that simulate a ride across an obstacle. The track rises at the start of a jump and turns back down again after the highest point is reached. This will briefly produce slight forces that make the rider feel weightless. • Steep turns: Steep turns are inclined turns that the tobogganer usually goes through at a high speed. The toboggan and its rider are slightly inclined inwards, producing G forces that make up the particular thrill of a steep turn. The special monorail build of the Mountain Coaster makes the experience of going through a steep turn even more intense and enjoyable for the passenger. • Photo points: Every theme park in the world uses photo points today. They provide guests with pictures, and thus memories, of special events they cannot document with their own phones or cameras. Most of all, however, they are a lucrative source of income for the operators, at times even outperforming the income from the tickets.